To me, my X-readers! We continue our Marvel NOW! datafiles with the broken Master of Magnetism, Magneto. 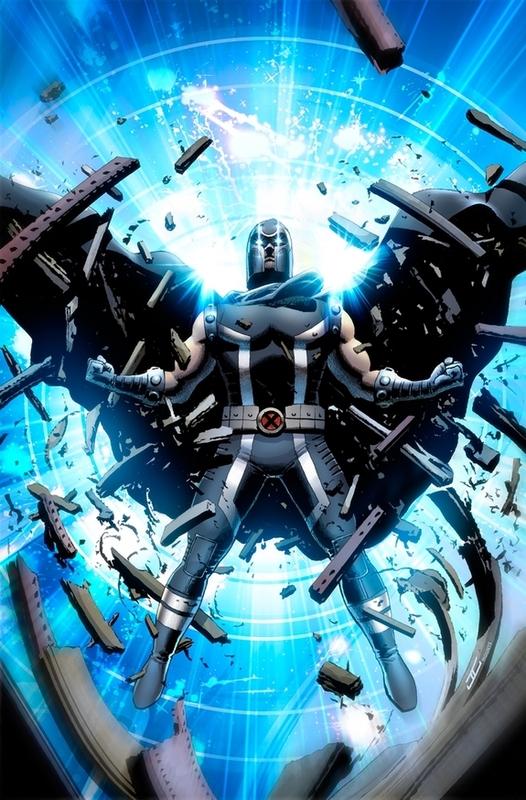 In the history of the X-Men, no character has gone through more changes and experienced more growth than Magneto, once one of the world’s most powerful mutants. The X-Men’s original arch-nemesis, Magneto’s ruthless path toward mutant equality/supremacy often put him at odds with the team and its founder, Charles Xavier. As the years passed, we learned that Xavier and Magneto (who usually goes by Erik Lehnsherr) had once been friends, working together for the mutant cause, but their differing attitudes toward violence and human prejudices pushed them apart. Circumstances slowly rebuilt that shattered friendship into a grudging respect, and after a badly injured Xavier was taken into space by his alien queen lady-love (it’s a long story), Magneto fulfilled his promise to take Charles’ place as mentor to young mutants. Since that time, Magneto has crossed back and forth across the line of hero and villain, sage and terrorist, making him one of the more interesting characters in the Marvel universe. More recently, he has been an integral member of the X-Men, acting as Cyclops’ consigliere, advising him on mutant matters — and packing a sizable magnetic punch when the team needs it. That situation changed drastically, however, in the aftermath of the Avengers vs. X-Men faceoff. Not only is Charles Xavier now dead — at the hands of his protégé, Cyclops — but the fierce, sudden dispersal of the all-powerful Phoenix Force left Cyclops, Emma Frost, and Magneto dramatically weakened and struggling to control their mutant abilities. Unlike Cyclops and Emma, though, Magneto never had a chance to possess the Phoenix Force. I’d say he got a raw deal. The current Magneto struggles to wield his powers effectively. Sometimes their use even causes him pain. This chaotic state has made him more desperate — and more cunning. Through it all, however, his number 1 priority remains, as always, the mutant cause. As he trains to regain his former strength, the eyes of allies and enemies alike are on him, wondering when the metal tiger will regain his claws. 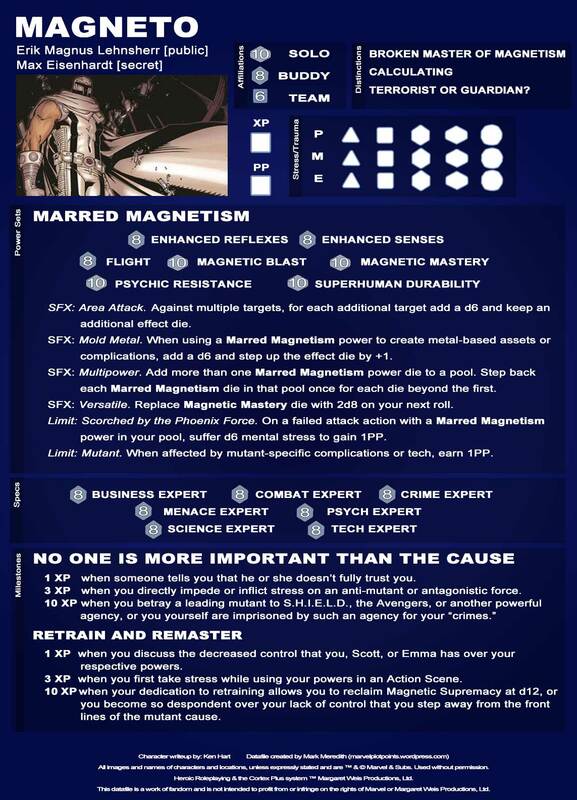 Please make a character sheet for Magneto in his prime. Check out the X-Men Avenged Event. It has the classic blue and gold X-Men along with Magneto from the same era. 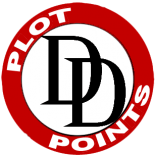 This entry was posted on June 2, 2015 by Ken Hart in Datafiles, Marvel NOW 2015 and tagged Comics, Marvel, Marvel Heroic Roleplaying, Marvel Now, X-Men.